This Carnelian crystal is often used by singers and other creative individuals. It enhances creativity, confidence, and passion. The Carnelian crystal not only boosts courage and self-confidence, but on a cellular level it purifies the blood and improves circulation, a must-have for any stressful situation. Note that each ring is crafted with natural gemstone free of size, therefore the color may vary slightly from image shown. The Carnelian crystal is a warm, vibrant stone that boosts confidence and the power of true expression. This bright and cheery version of Chalcedony gets its brown and orange red specks, bands, and stripes from iron impurities, which look best when polished. Its bold energy brings a rush of warmth and joy that lingers, stimulating and empowering. Known as a stone of motivation and endurance, leadership and courage, Carnelians have protected and inspired throughout history. 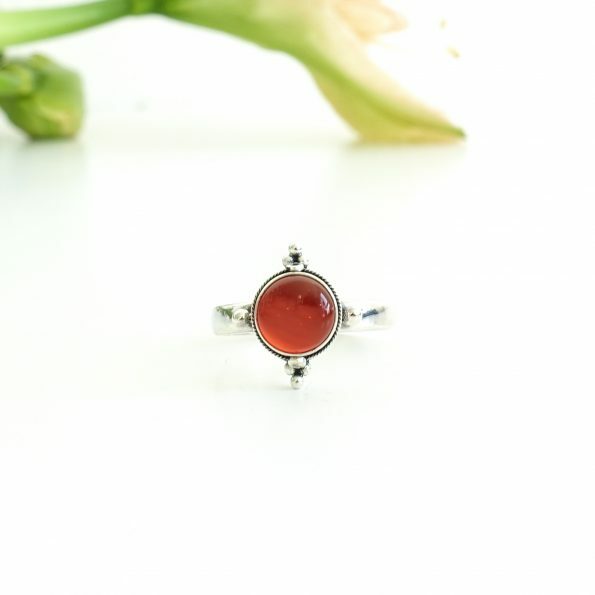 You want to order this Carnelian creative ring but you don’t know the size? Use a measurement tape to measure the inner diameter of any ring you have.